Ryan is a versatile player who across his career has played in every central position – in the heart of defence with Arthurlie, as a defensive midfielder, as an attacking midfielder and earlier on as a striker. He joined Hamilton Accies from Clyde when 16 but did not make it at 1st team level there and moved into the Juniors with Kilwinning and Bellshill before making a name for himself at Vale of Clyde. 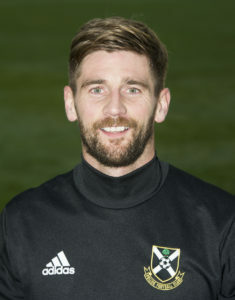 Pollok picked him up in 2009 and he had one season in the black and white before subsequent moves to Kilbirnie, Petershill, Renfrew and then Arthurlie in 2012 where he remained until his move to Lok early on in season 2017-18. It was announced in March 2019 that Ryan had signed up again for the 2019-20 season.